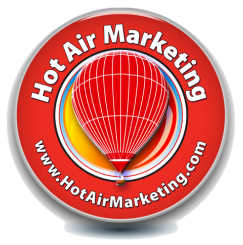 If you are an agency-based public relations professional, a brand manager, or social media marketing guru who is looking for ways to integrate a hot air balloon into your brand strategy, Hot Air Marketing wants to talk with you. We'll help you craft a custom initiative that will tie together with other social media platforms, contests and initiatives designed to capture the hearts of your customers. We invite you to complete our confidential inquiry form so that we may get things started. Please include the most appropriate telephone number where you prefer to be contacted. We believe in having conversations with our corporate and agency clients. Are you with a PR or advertising agency or are you internal to a company brand? The sky really is the limit when it comes to hot air balloons and your strategic branding goals. As your public relations partners, Hot Air Marketing can help you devise, design and deliver your message with devastating impact, leaving your competition looking up at your brand. Of course your customers will also be looking up at you in a completely new way.